This is Jay Rogers’ vision. 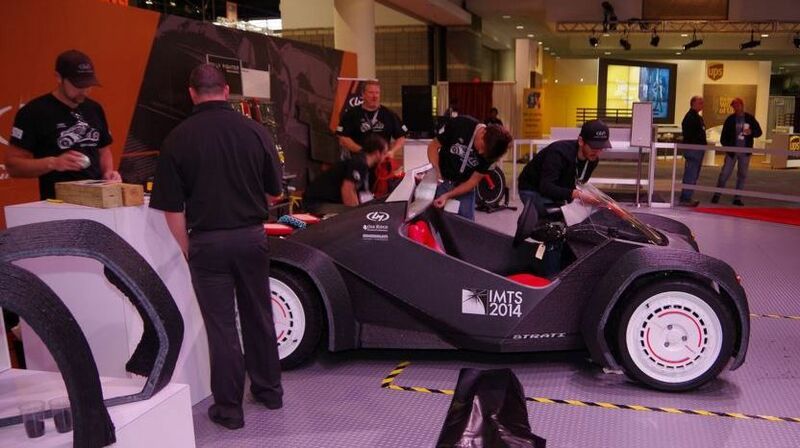 Rogers is the CEO of Local Motors, the company that just built the world's first 3D printed car known as the Strati. The electric, pint-sized two-seater was officially unveiled last week at the International Manufacturing Technology Show (IMTS) in Chicago, Illinois. According to Ford Motors, most cars have somewhere between 5,000 and 6,000 parts. The Strati has just 49, including its 3D printed body (the largest part), plus more traditional components like the motor, wheels, seats and windshield. While many 3D printed car models exist, there haven't been any other drivable ones that we could find. Auto manufacturers like Ford have been using 3D printing techniques for decades, but according to a company spokesperson, currently only uses the process for prototyping. (So far, there haven't been any 3D printed parts in Ford vehicles.) Thus, the concept of building a vehicle almost entirely through the 3D printing process is likely intriguing to traditional car makers like Ford. Although the Strati is just as expensive as a full-sized sedan, Rogers does not envision it as a luxury item. Instead, he believes it will be an affordable and highly customizable option that could be widely available by 2016 for between $18,000 and $34,000.